After two weeks, two biographies and about seven hundred pages, Rutherford Hayes reminds me of a better-intentioned, more savvy and far more intellectually gifted version of Franklin Pierce. Neither Hayes nor Pierce come to mind when choosing the most memorable (or successful) chief executives in the nation’s history. And sadly, neither has a particularly deep field of biographies from which to choose. * The first Hayes biography I read was “Rutherford B. Hayes: Warrior & President” by Ari Hoogenboom. Published in 1995, this was the first comprehensive biography of Hayes written in four decades. It proves detailed, well-researched, thoughtful and thorough. Written by an author sympathetic to Hayes, at both its beginning and end it attempts to convince the reader that Hayes was a far more decent and progressive chief executive than history recalls. During most of the book, however, Hoogenboom follows a facts-only style which wis balanced but rarely engrossing. 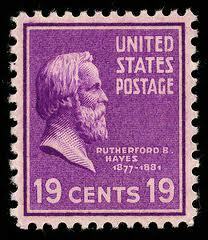 *The last biography of Hayes I read was “Rutherford B. Hayes” by Hans Trefousse. A member of The American Presidents Series, this biography was published in 2002 and is far shorter than Hoogenboom’s. And unlike Hoogenboom, Trefousse seems to view his mission as re-acquainting the modern reader with Hayes, not the rehabilitation of his legacy. Although I learned a great deal about Hayes through these two biographies, I don’t feel like I know or understand him on a personal level. Hoogenboom did a far better job conveying Hayes’s “inner self” than did Trefousse, but neither were able to fully humanize him. This is somewhat surprising because Hayes left behind a large collection of diary entries and letters…but perhaps Hayes, like many people, is simply destined to remain a bit opaque. ***During my journey through Hayes’s life I discovered a biography I need to read on my next pass through the presidents: Harry Barnard’s 1954 “Rutherford B. Hayes: And His America.” Prior to publication of Hoogenboom’s biography this seems to have been the standard Hayes biography and is undoubtedly worth reading. First, I just have to thank you for this blog! After reading “Team of Rivals”, I was inspired to start my own journey through presidential bios (just one for each at this point 🙂 ), and your blog has been my go-to resource for deciding on my next book. Due to limited availability within my county’s public library system, the only book about Hayes I could find was “Fraud of the Century.” Although not a presidential bio per se, it does shine a spotlight on both Hayes and Samuel Tilden in the context of this highly contested presidential election. Although I’m not even halfway through the book, I’m struck by the stark contrast of his characterization of Grant, his presidency, and several specific incidents involving members of Grant’s circle (compared to Jean Edward Smith’s portrayal). I’m sure must tire of readers suggesting more books to add to your pile, but if you do read Fraud of the Century, I’d love to hear your thoughts on Morris’ take on events! Thanks again. I barely recalled learning about the 1876 election in high school and that was the extent of my prior Rutherford B Hayes knowledge, so I was really looking forward to reading Hoogenboom’s biography. I enjoyed Hoogenboom’s fact based v. story telling style. As Steve mentioned, Hoogenboom was generally favorable to Hayes, but was also able to critique as times, but in general the critiques seemed to focus more on “the times.” For instance, in presenting Hayes as somewhat naïve, the fault is portrayed more to lack of executive power and continued disloyalty from the reconstructing South. Overall, I really enjoyed this volume and came away with a good understanding of Hayes experiences and views. I was glad to see you didn’t have Eckenrode’s “Rutherford B. Hayes: Statesman of Reunion” on your list. Unfortunately, it was the first Hayes bio I purchased (as it is the only one published by Easton Press, and I wanted to complete my library of Easton’s volumes). The author has strong racial views, which he has no shame in sharing repeatedly and they have nothing to do with Hayes. It is true there is little on Hayes, even Pierce I feel has been better addressed as he has the wonderful 2 volume treatment from Peter Wallner. I am looking forward to “The Election of 1876” by Michael Holt. While not a bio, I’ve heard it’s an excellent treatment of one of the most interesting elections in our history. Imagine if today we didn’t know until just days before the inauguration who would actually be inaugurated! And this back when it wasn’t until March. I recently finished Barnard’s Hayes biography, and I have to say my opinion of this book sounds eerily like your comments on the Hoogenboom book. You expressed almost the same sentiments I thought, including a sense of detachment from Hayes as a person. As you mention, this was particularly odd because Hayes left an extensive diary, and usually diaries offer a great way to ‘humanize’ an otherwise misunderstood person. The one plus of the book is it provided ample historical context of surrounding events, so Hayes didn’t seem to operate in a vacuum. The other interesting thing is, Barnard devoted about 100 pages (of 525 pages of text) to the Hayes-Tilden election debacle. This was interesting, and likely more in-depth than most readers will want, but Barnard’s pace made it readable. I would only give the Barnard book 2-1/2 stars. Not having read anything else by Barnard, I can’t tell if it was the author or the subject that was lacking here. But, based on this bio, I’m not sure I’m very interested in reading further bios of Hayes. One other interesting note was, apparently after Hayes was president, he attended a rally, and no one knew who he was– Hayes expressed that he felt like he was unknown even in his own time. This suggests even he might have been aware his legacy wasn’t going to be great. I’m trying to find an interesting Hayes book and am halfway through Trefoussee. You are right; his heart is not seemingly in it. I read some of Bernards and it seems much more humane, or concerned with Hayes’ humanity. It brings up another point I wanted your thoughts on and that is that some figures are more wan, less compelling to read about. Having just finished Grant by Meachem and prior to that two of your excellent suggestions on Lincoln, it is hard to be interested in a figure who seems to lack soul, for want of a better word. Though a lot could be said on this, including what’s in the eye of the beholder, I think that some people combine great depth of feeling, not necessarily just emotion, with great intellect and character to make them extremely interesting to know and read about. Others may have great intellect and character, as Hayes likely did, but if they do not exude a great depth of feeling, they are more easily portrayed as a collection of actions or facts, and relatively boring. I think a lot of the presidents between Jackson and Lincoln are examples of this.